If you think about it science fiction is really just fantasy, isn't it? Fantastical ships which travel faster-than-light, are just as impossible as Harry Potter flying on a broomstick, a motorbike or in a Ford Anglia. 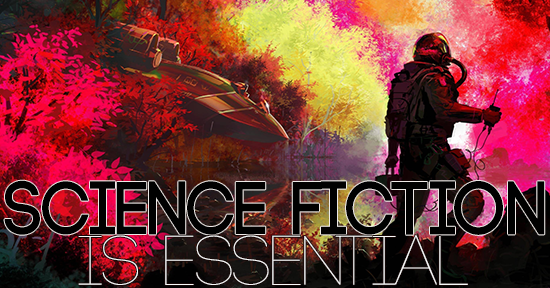 So what makes science fiction different from a fantasy story? The answer may surprise you. Science fiction is built on thought experiments, which explores hypothetical possibilities and the consequences of any science and technology developed in that scenario. It's beauty is that is can cross over with a lot of other genres of fiction including horror (the Alien franchise), fantasy (the Star Wars franchise) and historical fiction (Steam Punk). What's important about science fiction, even crucial, is the very thing that gave it birth-the perception of change through technology. It is not that science fiction predicts this particular change or that that makes it important, it is that it predicts change. Good science fiction explores change and how this change will affect us. Both forms of literature ask the question what if or just imagine, however a good science fiction story should also make us look at our lives in a different way. Whereas fantasy asks what if magic existed or just imagine dragons were real, good science fiction will ask the what if and just imagine questions and then go on to ask questions like where have we come from? and where are we going? and then try to explore the often unexpected, social implications of various breakthroughs and technologies, and how this may change us, in light of our reactions to other historical changes. For example: Scientists have found a way to reverse the ageing process, extending the lifespan of mice by 20 per cent and raising the prospect of an anti-ageing treatment for humans within a decade. A good science fiction story will not say just imagine people live longer and go from there. It will ask the questions: How have we shared previous medical breakthroughs, historically? Have we shared them out equally or have an elite few hoarded it for themselves? (Where have we come from). Once we've decided on an answer to those questions, we must then decide, in light of our answers, how this will this affect us in the future? How will this change us as people, as a society? (Where are we going). The story may then explore the idea of whether we should live longer, will it be beneficial or harmful for us as a whole. As Ursula Le Guin says, after reading a good science fiction novel should come away changed. It's a toolkit for life. The great thing about reading science fiction is that because we have suspended our disbelief and been changed by living in world created by an author, if only momentarily, we are now open to new ways of thinking. We too, have been shown how to conduct a thought experiment. For me I find that stories in which I don't like the premises or the path they took, while frustrating at the time, are better reads, because they make me think more. I have to consider why I didn't agree, what I would do differently and why. It's even better if you can discuss this with someone else after you've clarified your thoughts. And the best thing is that this prepares you for real world. Yes, you heard me right, science fiction prepares you for real world applications. The ability to rigorously imagine future outcomes based on incomplete information (and uncommon imagination) with the same diligence that many use to assess immediate economic, political, emotional and business conditions is a bulletproof skill. It’s a practice that sparks creativity, uncovers new opportunities, and improves current operations. Science fiction is a toolkit. A toolkit for imagining what’s next, and how to get there—no matter how big or small. The real world is catching up to the imagined worlds of science fiction. We’re running out of literary runway for our ideas to take flight. Thought experiments matter, even if they’re light years away. Because more than ever, individuals, businesses, governments and societies are in uncharted territory. Which is why using the books we have to imagine the world that we don’t is more important than ever. If you're new or unfamiliar with science fiction, want to understand the genre better or wanting to read more of it, This series is aimed at you! I wanted to to share my passion with my friends and I'm hoping that you the reader will benefit as well. 1. "My Own View," The Encyclopedia of Science Fiction, Holdstock, ed., 1978 Asimov on Science Fiction, pg 5.